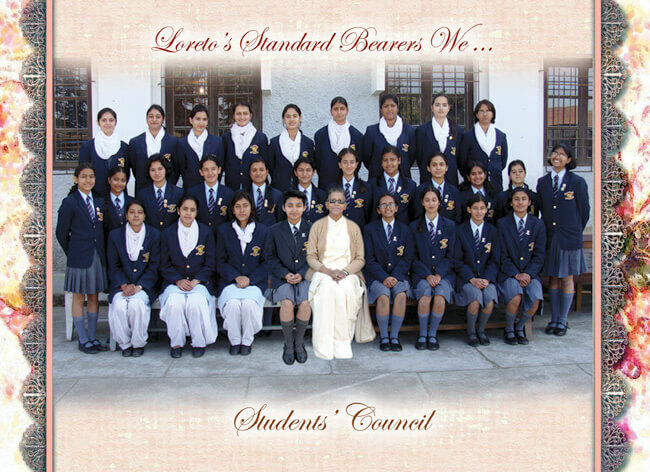 Standing Left to Right 1st row : Pragya Chitkara (Associate Head Girl), Harshita Kashyap (Head Girl) and Suhana Thakur (Vice Head Girl). Standing Left to Right 2nd row : Aamulya Saxena (Captain-Ashok House), Amberina Sud (Vice Captain- Ashok House), Hariti Mehta (Captain-Tagore House) ,Gunisha Giri (Vice Captain-Tagore House), Urvi Khanna (Captain- Sports), Principal Sr. Stephanie Rodrigues, Mehak Thakur (Vice Captain- Sports), Rhythm Zinta (Captain- Shakespeare House), Asmita Sood (Vice Captain- Shakespeare House), Ipsa Thakur (Captain- Nehru House) and Arshya Roach (Vice Captain- Nehru House). 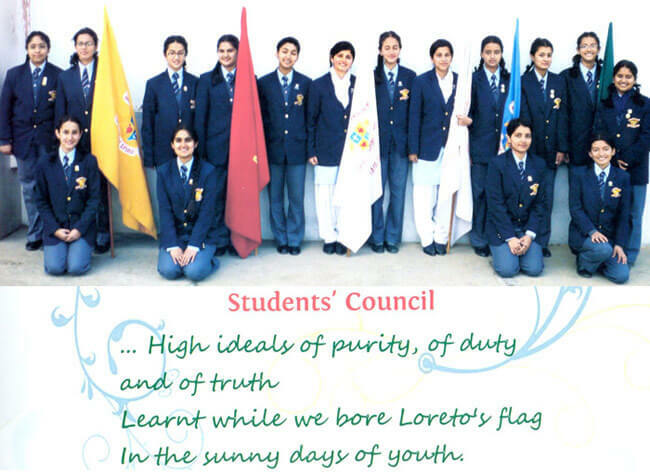 Standing Left to Right 3rd row Paridhi Gupta (Captain- Charity House), Alankriti Avasthi (Vice Captain- Charity House), Radha Mangla (Captain- Hope House), Mehak Verma(Vice Captain- Hope House), Arshiya Bhardwaj (Captain- Sports), Sia Kapila (Vice Captain- Sports),Vishudha Sood (Captain- Joy House), Mannat Sharma (Vice Captain- Joy House), Rijul Rangta (Captain- Peace House) and Gitali Gupta (Vice Captain- Peace House).